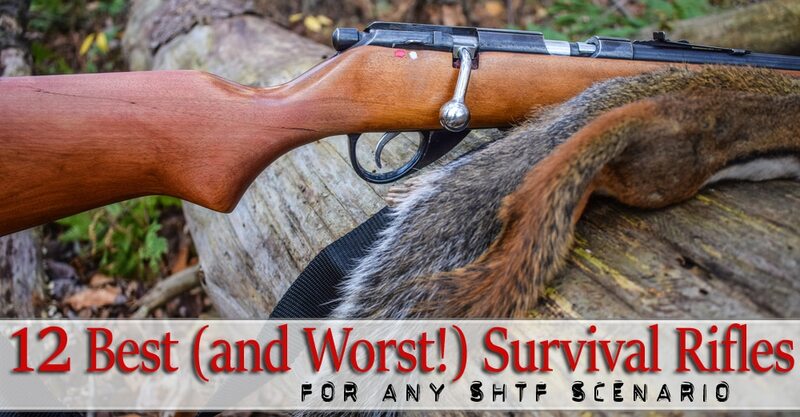 When comes to a SHTF scenario, you need to have a reliable survival rifle. However, picking the right gun can be overwhelming especially with the many guns in the market. 11) Ruger Mini-14 Ranch 18.5"
If you need a rifle for target shooting or hunting, of course with attractive looks, then you have come to the right place. This guide provides you with important weapons for survival. The guns ate not only reliable but also durable. Check out these 12 best survival rifles for SHTF scenarios that you need in your company where survival is at stake. Although there are several types of rifles and calibers, each is best suited for a particular SHTF scenario. This means that owning more than one rifles is unnecessary unless you have a large family who can handle the guns. When confronted with a wilderness survival situation, there is a high chance that you might need to live off the land. This means that you need a firearm that is effective in a small game. The good thing is that there are several small game animals including possum, rabbit, squirrel and more that can see your family through this situation. Regardless of the hunting expedition, bringing down small animals can be quite tricky. Luckily, there are many excellent rifles suitable for the small game arena, and each can fire different types of calibers. The 17HMR cartridge is quite famous for good reasons. It has a remarkable velocity and uses a variety of varmint rounds. The .22 magnum is also great due to its extreme power that supersedes the .22LR. However, the .22LR is the best for survival. It offers incredible performance and is highly rated for various reasons. Firstly, it is versatile, desirable and affordable round. Secondly, you can pack them in your pockets and don’t feel any burden. They are quite light weighted providing the merits of your survival needs. The Scoped Ruger 10/22 takedown is our best pick in .22LR. While a Remington 597 is a great alternative, but the internal parts of the Ruger are more impressive compared to this Remington’s delicate internal parts. So, you want to bring down a ten point buck just 300 yards away. Which rifle do you need? Well, you definitely need a strong, stealthy long-range rifle. A cartridge that remains deadly even 300 yards distance or more is the most suitable. You don’t want just to wound and lose him. The shot has to be precise. Even if the shot is poor and hits the leg, it should blow it clean off. Basically, the important thing here to emphasize is the accuracy, power and speed. In this case, the mid-sized cartridge won’t be practical anymore. However, the best would be 170-220 grain region in.30 calibres. Other great alternatives include .30-06. 300 Win Mag or. 308 Winchester. The Remington 700 is also an ideal choice. It features an innovative design that never runs out of date. In fact, it’s considered the mainstay of bolt action sniper rifle and a super deadly rifle great for hunting large game. Killing intruders at long range is no joke. You need to have the ultimate rifle and rounds designed for that particular purpose. Having effective signage can keep the enemies away, but you don’t want to scare them by firing in their direction only to miss them. That implies the rifle and rounds of ammunition used must possess excellent accuracy and lethality. One of the best to use is Remington 700. 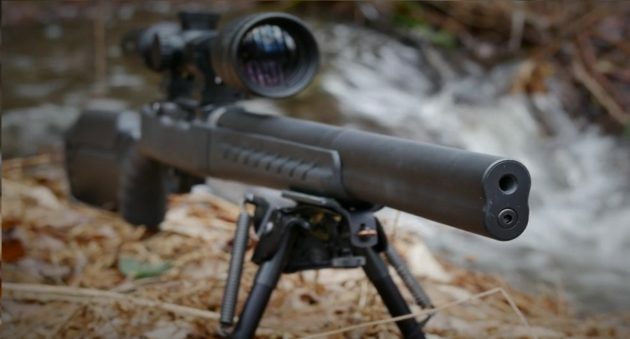 This survival rifle can kill a rifle at 250+ yards away, which means it can also take down your enemy. However, the advantage of the bolt action of the rifle on accuracy can also be a liability when the situation calls for follow up of a shot. While a dear might hang around for some time figuring out what’s happening, humans will realize immediately. In this case, a semi-automatic option would be best if the target is human. To this regard, the AR-15 in 5.56 NATO, scoped AR-10 in .308 NATO is great options. The AR 10 boasts an outstanding knockdown power. However, the AR 15 has a high-quality buffer to reduce the impacts of recoil, so there are no chances of missing the target. To understand the best rifles for close range defense, you need to understand your environments. 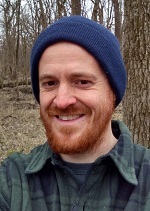 If you live in a dense forest, then your needs are quite different from someone who lives in a plain area. This means you require different rifles for self-defense. However, you need a firearm with enhanced reliability and accuracy in either case. 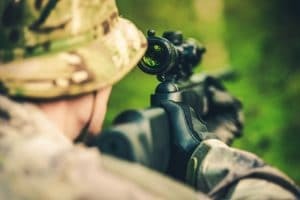 You need to focus on a weapon with excellent accuracy to hit a less than 200 yards away target. The challenge with close range is that there is a possibility of being shot back by the enemy. For this reason, every round must be precise and in no instance should the weapon jam. The AK 47 can blend well in such a situation. The only disadvantage is that accuracy of this weapon reduces once on full auto mode. 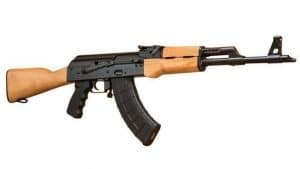 But, the “Americanized”, a semi-automatic AK-47 variant is a great firearm that can serve the purpose in this case and many other situations. You can choose to pick the standard 30-round magazine or go for the large option with 75 round drum magazines for your AK. Although the large one can offer more rounds, they seem heavy adding to the already heavy AK which makes the weapon extremely heavy. Furthermore, you might be tempted to spray and pray instead of aiming carefully with 75 rounds available. Ruger 10/22 Take-down is a wonderful choice if you want the best rifle for the small hunting game. It features a rugged and easy to clean design. Thus, it is best for going deep into the jungle and engaging in hunting the small animals that hide in thickets. This rifle is closely competed by the Remington 597, but there is still something special about this gun. It boasts a sturdy construction both in external and internal parts. With the incredibly durable design, the Ruger 10/22 Takedown rifle can serve you for decades. Apart from the rugged and weatherproof design, this rifle boats ultimate shooting power and accuracy. Hence, it is the best rifle for hunting small game. If there is a must have rifle for small game hunting then it’s the Henry Classic. It’s an amazing .22 LR which is the favourite firearm for many hunters than anything else. What makes this rifle one of the most famous .22 rifles available in the market today is its clear shoots and reliability. Besides, Henry Lever Action is remarkably affordable than other competitors’ rifles. The Henry Lever Action is designed with a good-looking American walnut stock. This exceptional quality is usually a feature of weapons which are double or thrice its price. Its action is extremely smooth such that most first timers are tempted to believe that the rifle has internal parts. This rifle is a great deal and can guarantee success in small game haunting when you find yourself in an SHTF scenario. It’s a reliable refile that you can pass on to your grandchildren. If you want a powerful rifle which you can easily hide, this the most practical option to have. It features plenty of plastic composite. Thus, it is very lightweight with only 4.25 pounds. It measures about 30.5 inches when unfolded, and 16.5 inches once folded. So, you can conceal it in a bag and travel with it as a self-defense machine. Besides, it offers a lot of power and can accommodate heavy rounds to suit your short-range shooting. The KEL-TEC Sub-2000 Rifle gives a great punch thanks to its 40 S&W ammo. Perhaps this is why most small game hunters prefer this weapon. It’s a suitable choice for SHTF scenarios that demands an effective rifle for survival. The ’81 is outstanding among other types of models in the Browning BLR lightweight series. It’s a carbine length lever-action rifle is built with an aluminium alloy stock, 20-inch barrel, rotary bolt locking system and a detachable 4 round box magazine which drops free when you press the release. It is available with a curved pistol-grip or a straight-grip. You can also find a take-down version that allows easy transportation and shipping. The long-action and short-action model ’81 can accommodate various hard-hitting calibres to suit a big game survival situation. They include 450 Marlin, 358 W, 308W, 300WM and 270 WSM. The advantage of having this weapon is that doesn’t only pack a punch, it is also easy to carry around. Besides, this firearm is designed with a short barrel that allows you to shoot in the timber, ground blind and from a tree stand. It comes with an easy loading magazine which enables you to get fast follow-up shots. In summary, if flexibility and durability are your concerns then this is gun will make a good investment. M70 Super Grade is one of the world’s most respected bolt-action big game rifle for solid reasons. It features enhanced pistol grip stock, fixed extractor, controlled feed, and MOA trigger mechanism for excellent performance. 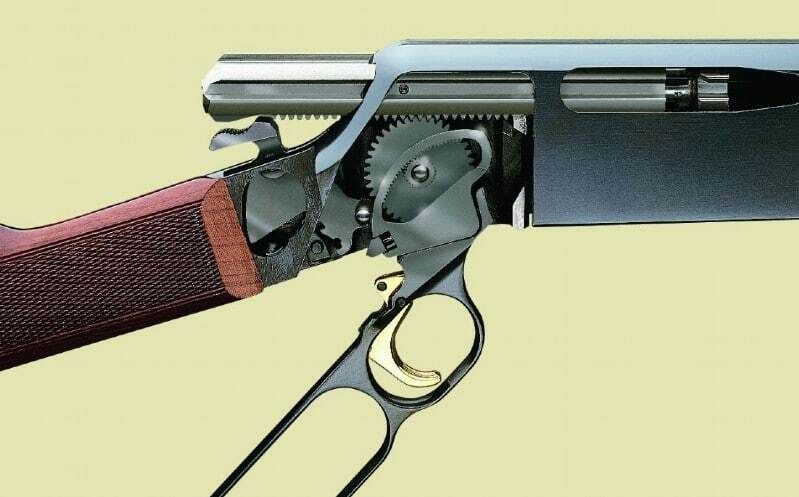 These features together with its classic Mauser action that has a 90-degree bolt lift and the two front locking lungs. It comes with a 24-inch barrel, weighs over 9 pounds and chambered for .30-06 loads. The incredible weight increases its shooting accuracy making it ideal for the wilderness survival big game. With this rifle, you get an easy time carrying it, and you don’t have to worry about being knocked over by recoil. Besides, its new MOA trigger can be adjusted, and its receiver makes loading much easier and quicker. Kimber 84M is another bolt action rifle that will give you an impression that it’s customised to fit your needs. It is chambered in short-action .308 Win, 7mm-08 Rem, and 43 Win including .338 Federal and a 5-round magazine. The weapon also has an adjustable trigger designed t release at 3.5-4 pounds. The overall length of Kimber 84M is 41 1/4 inches and has a 22-inch light contour barrel. Together with its scope and mount, the firearm weighs 7 pounds. 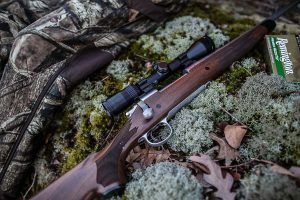 This rifle is ideal for the big game offering you easy loading, steady balance, short barrel-length, lightweight which makes it a great bolt-action rifle. Its light weight is critical because it carrying it won’t trouble you. Its adjustable trigger is an outstanding feature that has earned this hard-hitting ultralight weapon respects for its accuracy. AR-15 is designed in different styles, and it’s one of the widely used rifles across the world. This semi-automated AR-15 emerged to become a favourite weapon used by civilian communities, law enforcement and in the military as well. Its popularity can be attributed to its reliability and accuracy with many levels of customisation due to its two-piece receiver and the modular design. The rifle can fire .233 or 5.56x44mm calibre rounds delivered from a 30-round magazine. A great rifle in the AR-15 series for self-defense in long range is the DPMS Sportical. It has a lightweight and comes with ready-to-shoot carbine-style AR that has an adjustable stock and a 16-inch barrel. Just like most Ars, this rifle can be upgraded and accommodated various accessories to suit your needs in an SHTF survival situation. The stopping power is an important aspect of consideration in a survival rifle. The Armalite AR-10 is designed to work well for defense in long range situations. It features impressive features, and its light weight won’t burden you when you need to move. The rifle is also gas-operated, magazine-fed, air-cooled and uses a piston within the bolt carrier that has a rotary bolt locking mechanism. It conventional layout entails a buttstock, handguard, reinforced fibreglass pistol grip, aluminium alloy receiver and an in-line stock. It features high speed and remarkable striking power which makes it a suitable rifle when you are confronted by enemies such as bears or angry mob at some distance. The weapon delivers amazing stopping power with detrimental damage to the target whether in close or long range. It’s no doubt why the rifle was a key battle rifle in the US military at some point in time. 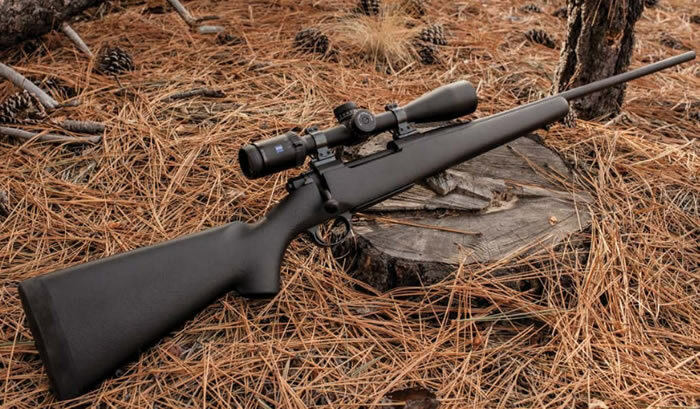 If you are looking at getting accurate shots over long distances for defense, then you will want to consider Remington 700. It is designed by a well-known and respected firearms producer, Remington. This means that its quality is exceptional and satisfaction is guaranteed. The rifle uses powerful 7 mm Remington Magnum rounds which enables it to punch hard even at long ranges. The 7mm magnum rounds enhance the rifle’s accuracy in great distances due to the boost in muzzle velocity they deliver. You will be astonished at the extreme level of damage they leave upon hitting the target. Besides, Remington 700 can be used in various types of weather. It is built using the outstanding Bell & Carlson M40 synthetic tactical stock. Its reliable bolt action round chambering also makes maintaining the rifle much easier. If you expect to find yourself in an SHTF environment, then you can count on this rifle for survival. This rifle is specially designed to hit the target at 200 yards range. It does so with great precision and knockdown power. This long calibre rifle can help you survive a disaster more than another tremendous tactical firearm. It features a sturdy design but is lightweight. It offers little kickstand or recoil. Thus, it is great for those guys who are not used to guns. It can be a great option for kids and young adults who want to master the art of shooting. It features a tough and over-engineered design. Also, it is easy to customise with various accessories to increase its convenience. However, the extra accessories may increase the overall weight. It uses 7.62×39 mm round which is lethal and travels at outstanding speeds. It has a high level of accuracy and leaves impactful damage. Aside from its ease of use and training, this firepower can be significant for the close and medium range. The carbine rifles usually come with 10 round rotary magazines that fit flush in the gun. It is easy to change magazine even for the beginner and is great. Thus, it is ideal for self-defense at short range like 100 yards due to accuracy, ease of use and speed. In addition, it features a threaded nozzle. Therefore, you can mount a silencer to eliminate excess noise. Despite having a wooden stock design, this gun is a real defensive weapon. It is small, lightweight and incredibly versatile. It can be a good hunting rifle as well as short and medium range defense weapon. Besides, it features an ergonomic design that allows you to outfit it with a scope easily. With the scope on top of this gun, your target has zero chances of surviving. Using the gas operated chambering its rounds are quickly chambered. Thus, it gives you added advantage if your enemies are already responding. Amazingly, this rifle only weighs 7.5 pounds when fully stocked with accessories. So, it is a great deal for defense as long as you won’t overload it with additional peripherals. Moreover, you can release up to 21 rounds before you need to pick another clip. In addition, it can readily use the Remington 223 rounds which are pretty easy to find. As old as it may sound, this rifle is one of the best for combat. Although it has not been active on duty since the Vietnam War, it was and is still considered a lethal weapon. The design was intended to be lightweight and compact as an improvement of the M1 Garand, and this rifle offers amazing speed and accuracy. This makes this weapon one of the versatile rifles for hunting game. Apart from its versatility, it is affordable and uses.30 calibre rounds. The standard version comes with 15 round magazines, and the gun is extremely maneuverable during close-range operations. However, it is becoming increasingly hard to get the original m1 carbine. But once you get one, the rifle is battle ready, and no one can mess you up in the hunting game. But, the modern version of the M1 carbine is the AOM130 and is readily available at a considerable price. This rifle weighs as little as 5.4 pounds and features 18 inches barrel and a traditional walnut stock. The .30 calibre rifle is becoming increasingly very hard to find and is very expensive once you are lucky. However, this is the only demerit that the rifle has but performance is exemplary especially as a hunting rifle. Selecting a good rifle to protect your family, property or for hunting is quite important as you prepare for an SHTF scenario. But you don’t want to spend months preparing only to experience challenges with the rifles when the time for survival arrives. 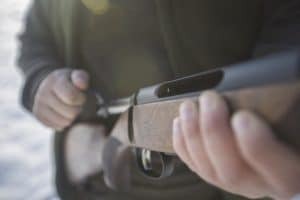 While many rifles are perfect for hunting and home defense in such a scenario, there are also many rifles that are not suitable. They have limitations such as lack of reliability, poor reload times, limited ammo capacity or poor stopping power among others. However, you can use some of these rifles for backup but never entirely rely on them for help in SHTF situation because they are not smart. Single action revolvers like Ruger Vaquero and Colt Peacemaker are not just beautiful; their accuracy is superb. However, that alone is not enough to make them a favorable choice for an SHTF situation. If we compare them with semiautomatic pistols and double action revolvers, single action revolvers lack reliability and power. Besides, slow reload time another disadvantage of these firearms. This is because you will need to remove every shell casing after firing manually. The fact that cocking the hammer for every single pull of the trigger is done manually makes these weapons unfit for an SHTF gun. Generally, revolvers in this category such as .500 Smith & Wesson Magnum, .454 Casull, and .44 Magnum are typically designed for hunting. However, the big challenge is that they can be excessively noisy and controlling them when firing is also difficult due to excessive recoil. This means that if you miss your first chance, then you will have lesser chances of hitting your target. You might also be blinded by the increased muzzle blast and flash when in a low light situation. The many drawbacks of these revolvers make them unsuitable for use during an SHTF scenario. For a wilderness survival big game to work, you need a highly reliable rifle with no flaws. 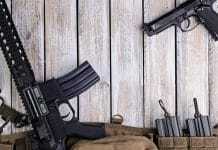 You don’t want to harm yourself in SHTF situations, something which could happen when using these guns. Most of Single Shot Shotguns and rifles are designed with chambers for .22 LR cartridges or 20-gauge shells for shotguns. Due to this feature, they don’t deliver the stopping power that is necessary for self-defense on long range especially when confronted with multiple targets. They are also built to accommodate only one shot which means that you will need to reload after every shot. This prevents you from aiming carefully at a moving target since you need to reload after firing each time. During a SHTF scenario, everything needs to be perfect, and you don’t want to waste any single chance of taking down the enemy. This is why you shouldn’t rely on these weapons for primary defense. Pocket Pistols such as Ruger LCP are increasingly becoming trendy due to their small size allowing users to keep them in their pockets. If you need a gun that you can hide without it getting noticed by anyone, then you may find these firearms appealing. However, these class of guns are not suitable for SHTF scenario due to poor power. They also have high recoil that will limit your firing rate and accuracy and the stopping power is not sufficient for self-defense on short range. In short, you don’t just pick a gun for use in a SHTF simply because it can fit in your pocket. Finding a rifle that you can rely on to defend yourself or your family means looking beyond concealability. It should be able to deliver perfectly. This is guns in this category might not be the best to have for a SHTF scenario. Apart from protecting you from misfires and recoils, this bulletproof vest allows you to carry important rifles accessories. You can now go to the range and keep your gear ready for use and secure. The design of this vest features a contoured right armhole which delivers a rigid and natural shooting motion. It also features a removable shooting pad at the right shoulder. 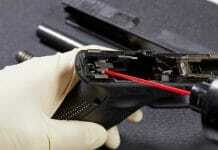 This is an important feature that ensures recoil is greatly reduced to a tolerable and safe level. 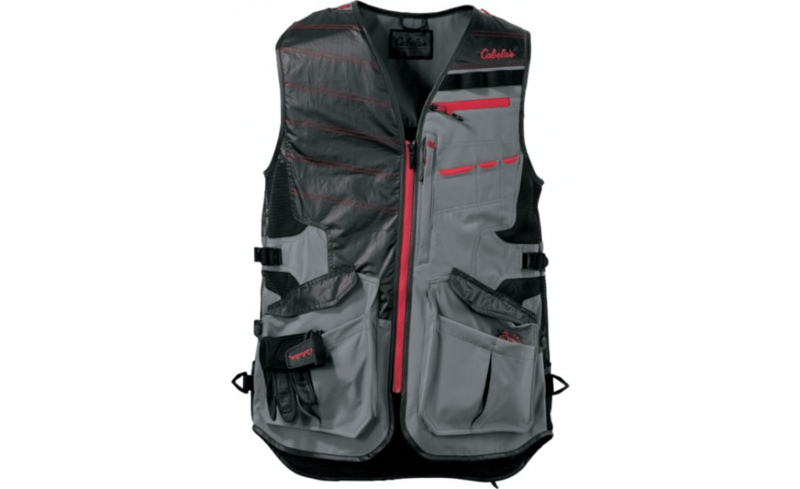 Also, Cabelas men’s shooting vest features a zippered media pocket. This pocket is uniquely designed and secures your device during the extended shooting process. For additional storage, this men’s shooting vest features flapped pockets for storing additional accessories. Additionally, it has bellow pockets which are for storing shotshells. It’s top-rated design also features side panels made of polyester material. Thus, the shooter enjoys comfort due to increased airflow. Besides, this vest makes you stylish when you are in the field. In fact, it features shock-corded loops. Hence, it is pretty easy to organise earplugs, sunglasses and other functional accessories. Are you looking for the best magazine carrier? The MTM Tactical AR-15 offers the best features for anyone looking for the safest and convenient way of storing or transporting magazines. It features a sturdy design and has a capacity of 15 AR-15 magazines. It is incredibly versatile since it can hold both 20 and 30 round 223/5.56 magazines. It keeps you stash secure due to the generously padded interior walls. It features pre-cut foam, and the nicely designed ridge keeps the magazine secure and safe from bumps. It also eliminates scratching and sliding when the cargo is on the go. 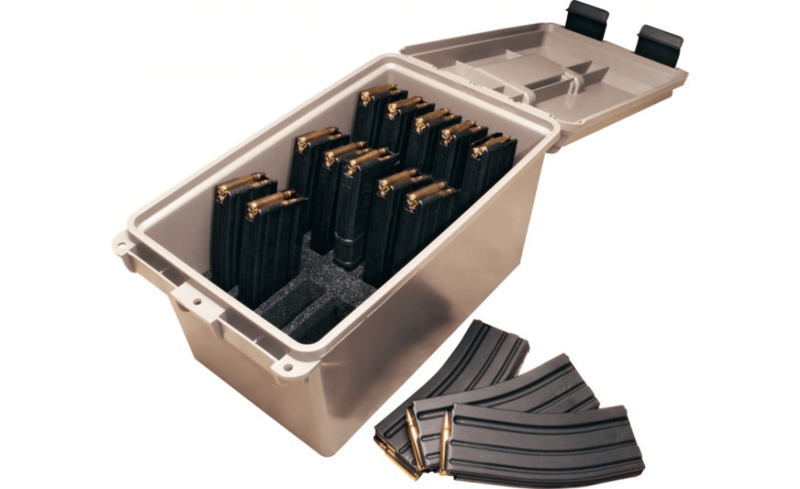 The can is designed to offer safe storage and transportation of magazines and ammo. However, the product doesn’t include the ammunition. It is only storage can for ammunition. Besides, it offers perfect closure to ensure antitheft and safety. Thanks to the O ring seal design with dual side latches which play the role of the tight closure of the can. For added safety and security, they can also feature three padlock tabs and four ties down points which increase the peace of mind. Featuring moulded in ridges, the can is stackable, and therefore you can carry several in a limited space. This is one of the best rifle sling system available today. It features an innovative design that makes it very quiet and efficient in the field. Quake Claw uses a unique concept that is quite new to the market. It features Hush Stalker swivels designed to eliminate squeaking and sliding. In addition, it has a rubber claw pad that has excellent nonslip features to grip your shoulders comfortably. Furthermore, this pad stays securely on the shoulder without bouncing and sliding. This is very important when you’re in the field since you won’t have enough time. Besides, the unique pad material is designed to stay excellently flexible even when the temperature is extremely low. This flexibility is perfect because you will need a high degree of maneuverability in the field. Also, the pad material is UV stabilised. Hence, it can resist cracking and fading as a result of prolonged exposure. Another advantageous feature of this sling is that it doesn’t retain water. This means that this it performs in all weather conditions, unlike the foam and leather slings. Are you training to have perfect shots without success? 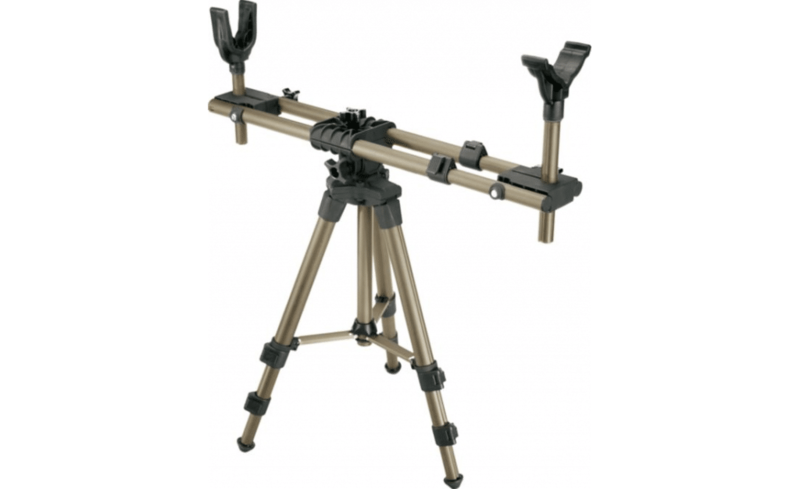 The Caldwell Deadshot Field pod offers a rock solid bench stability to ensure the best balance of your sniper rifles and other arms. This innovative cast aluminium hub is incredibly lightweight enabling it to boasts excellent portability so that you can position it anywhere you want. It features an ergonomic design that enhances easy rotation and tilting. Therefore, this ergonomics ensure quick and stable target acquisition. This aluminium Gun rest bench also has a high strength extruded construction. The incredible strength and corrosion resistant properties make it one of the most durable shooting benches which are compatible with a variety of rifles. The design is also unique since it features rear and front supports which independently adjust in height. This increases the maneuverability of the gun depending on the shooting trick and target. Additionally, the upper frame is adjustable and also the pivot point. That being said, you can have a perfect balance adjustment and incredible stability. The gun rest also features a robust dual tube frame design to ensure perfect stability when loading and shooting. Moreover, the one-piece design allows you to collapse easily and fold to facilitate hassle-free storage and transportability. The innovative concept of this shooting rest doesn’t end there. The legs are independently adjustable between 20 to 42 inches. This adds the ability to mount and use it on uneven surfaces. Besides, the feet of this rest are rugged and provide excellent grip on various surfaces. It is evident that not any great weapon is suitable for any situation. Every rifle best performs in a particular SHTF situation. This means that you should be prepared with a rifle that fit the SHTF situation that you anticipate. When making a selection, never forget that the rifle you pick could be the lifesaver for you and your family. Always go for one that is reliable with excellent performance. 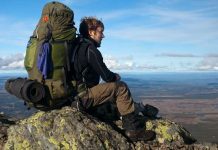 The purpose of these 12 best survival rifles for SHTF scenarios alongside the worst rifles for each situation is to give you insights on which best suits the survival situation. If you make your selection, then your survival until the order is restored can be guaranteed. A long time ago, a friend asked me to tell him which firearms would fill as many SHTF situations as possible. Whether it is a weather condition, earthquake, attack from foreign enemy…whatever. The best firearms is the one(s) that you currently own, know and use. They are your favorites, they are your friends, you know every quirk about them, and you already own plenty of ammo for them to fire. Those are the best. 1) The pistol that your local law enforcement officers use. 2) The shotgun that your local law enforcement officers use. 3) The pistol that is issued to infantry soldiers by the US Army. 4) The rifle that is issued to infantry soldiers by the US Army. Because when the SHTF, the ammo that is used by those four weapons will always be available in quantity. The federal, state, county and local city governments will always ensure that those weapons have ammunition. Whether the aliens attack from space, or an earthquake changes the flow of mighty rivers, or the second amendment is unexpectedly repealed next week, those 4 weapons will always have ammunition available in the area where you live. A fifth option is purchasing an AK-47 or one of its variants that fires AK-47 ammo. Every enemy of the United States uses AK-47’s, and they will bring plenty of ammo with them if they choose to come into our county. It is amazing that don’t even mention the TC Encore single shot pistol and rifle interchangeable system. The number of barrels and calibers available is amazing. It is how accurate you shoot not how much lead you put down range. Look at sniper school training. They teach accuracy not how much ammunition you can use up. What rifle and pistol is best? The ones that you can shoot accurately. In a shootout, or a hunting situation, it doesn’t matter what you miss your target with. It is the rounds that hit the target or the assailant that do the job. So, what ever weapon you feel confident using and you can use it accurately is the best choice. Don’t get me wrong, you must also match your weapon to the intended use. A 22 will kill a grizzly bear, but it isn’t my first choice. A pistol with a 5 inch barrel is not a long range weapon, and so on. Practice with whatever you choose, practice often, and if you can reload your own ammo, that way you can tailor the cartridge load to what shoots best in your weapons and what gives you the most accuracy. Hitting your intended target the first time, every time is the name of the game. Remember what Jack O’Connor said “a 100 grain 243 round placed right behind the shoulders will get you more elk steak than a 300 magnum in the guts”. The 30 carbine is one of the most underpowered “combat” rifles ever. My Dad fought in the Battle of the bulge and he said the average German absorbed 10 rounds of 30 carbine before knowing he was hit. Any one thinks this is anything more than a toy to plink with knows nothing about ballistics.